OK that is all from us after what proved to be an incredibly one-sided final. Amazing to think one year ago, Shaun Murphy thought about giving up snooker and now he is a Masters champion. report on Murphy's win by my colleague Shamoon Hafez and, until next time, goodbye. Q: Matt Foster I think a comeback from you would spark great interest I'd love to see it, have you ever thought about coaching another professional? SH: I do get asked advice now and then from some pros, but if they keep doing it I'll have to start charging them! I don't think I'll ever do it full-time, I don't have the patience. Q: Dan Fuller Have you considered a comeback after Ronnie overtook your record of most centuries? SH: I've not considered a comeback because of that. Even if I did return, he would still be playing more tournaments than me so I'm not going to catch him. Q: Simon Gordon Roberts. At the moment Ronnie is the star of snooker. Do you see anybody on the circuit replacing him? SH: Judd Trump's time might come in two or three years. Q: Connor Scantlebury. Do you reckon that Ronnie O'Sullivan has the ability to beat your crucible wins? SH: He has the ability no doubt, but whether he can win another three remains to be seen. Q: Daniel Crossfield. Do you think Shaun can win the world championship this year if he plays like he has at the Masters? SH: Yes he can, he seems to have a better 'killer instinct' over the last year and he should have won more majors with his talent. Q: Ashley Phillips. Best player you've played against? SH: Ronnie O'Sullivan is the most talented, but I loved my battles with Steve Davis. Q: Wullie Mccandless. Did you ever feel sorry for an opponent and did you ever wish someone to win so you could play them in the next round of a tournament? SH: No, I've never felt sorry for an opponent. The snooker may be off the television now and we have just about hoovered up all the reaction to be had but we still have a few other bits and pieces to keep you entertained. Shaun Murphy has finally got his hands on this trophy. He had set himself a target of claiming it by 2025, so he is just slightly ahead of schedule. What next for the Magician? Saisrikanth Y: Enchanting snooker by Shaun Murphy. Great to see him complete the triple crown. The Masters has been a fantastic tournament. Marge Dacre: Well done to Shaun Murphy! He played like he was at the practice table enjoying himself. 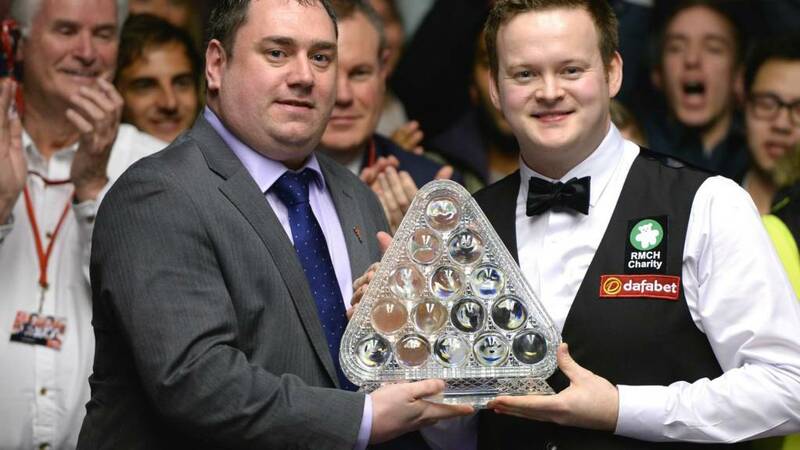 Aodhan: Congratulations Shaun Murphy @Magician147 2015 Masters Snooker Champion. "It is never nice to get a drubbing in the final but it was just one match. If you look at Neil Robertson's standard in the tournament as a whole it was very high. "However, you judge yourself on winning and losing and you beat yourself up on the last defeat." Shaun Murphy goes home with the trophy he has been after for a few years and £200,000 in his pocket. Not a bad week at all. Hazel Allen: Yayyy well done Shaun Murphy! Triple crown! Peter Revill: Murphy deserved that. Shame there's not any more, but he was dominant. Hollum: Massive congrats to Shaun Murphy for getting the triple crown! So well deserved! Masters winner Shaun Murphy: "It is unbelievable. I cannot believe it. I first came to this event when I was 12 and my dad asked if I felt I'd ever play in it and I said I'd love to and to win it is unbelievable. "I just decided to stick in there and be patient. In all I have played pretty well this week and I am blown away." As Neil Robertson says, Shaun Murphy joins the 'triple crown' club, today's win completing the capture of World, UK and Masters titles. Neil Robertson is first up to speak, and he is gracious in defeat: "Shaun played very well today. "I just could not produce the sort of snooker that got me to the final. I'd just like to say welcome to the triple crown club. Shaun is a worthy champion." All over as Neil Robertson cruises to victory, putting the frame out of Neil Robertson's sight. What a performance! Nothing on for Neil Robertson and Shaun Murphy is back in. This could be it, that Masters trophy is in touching distance. The difference between these two players today is highlighted by the points scored by the two, 819 for Shaun Murphy compared to 339 for Neil Robertson. Murphy fails to add to that, though, when he misses a red bottom right with the rest. He leads 23-7 in this frame. Shaun Murphy misses a long red and concedes a foul when the black goes in the middle left pocket following a ricochet. Neil Robertson's mind looks to be gone though, he misses a regulation red and Murphy is back in. Damage limitation for Neil Robertson now, Shaun Murphy is playing for the Masters title in this frame. Can he secure it? The 12th frame is under way. "Whenever you lose the first five frames at this level it is always going to be tough. You are under pressure every frame. Neil Robertson got a bad start and he was never able to recover." In this form, there was no stopping Shaun Murphy and he does enough to ensure Neil Robertson stays in his seat. One frame away. Anyone up for another episode of Coast? Nothing doing on Neil Robertson's visit although he spreads the reds about and a chance for Shaun Murphy to finish off here. He is 52 points ahead with only 51 remaining. Shaun Murphy finishes off what Neil Robertson started, potting a red into the middle pocket. A chance or him to build a healthy advantage, although there are still some bunched reds to deal with. He tries to cut one into the bottom left pocket, misses but not much on for Robertson now. Shaun Murphy manages a break of eight in return, his visit ended when a long red misses the yellow pocket. Nothing left open for Neil Robertson and a safety battle ensues, before Robertson attempts a double into the middle pocket, but the red strikes both jaws and stays out. Neil Robertson gets off the mark but he can only manage a break of seven as he misses the black. It is just not his day. Stephen: I'd 8-2 be Neil Robertson right now. A few shouts of encouragement for Neil Robertson from the crowd before Shaun Murphy steps up to break in the 11th frame. "I think that last frame was massive. It puts a totally difference perspective in the match, that was the last throw of the dice for Neil Robertson." Shaun Murphy's break ends at 127 - the same as he got in the first session but he is marching towards victory here. We might not need a mid-session interval at this rate. Two wins away. Black bottom left and there it is! The century and on he goes. Neil Robertson is not getting another visit in this frame. Shaun Murphy drills the black into the bottom right pocket and he is storming his way towards a second century in this final. 89 so far in this break. This is looking good for Shaun Murphy as he rattles his way past the half-century mark. There's plenty of loose reds and a good chance for a big score here. Another mighty fine long red into the bottom right pocket and Shaun Murphy is up and running. Daniel: That pink is probably the worst shot Neil Robertson's played in years. Could end up crucial. Adam Todd: Absolute giveaway! As if Robertson wasn't up against it enough already! 7-2 Murphy, and this could be a very early finish! "It is not very often Neil Robertson plays a poor safety shot. The amount of pink that was sticking out in that frame, once he clipped it, there was only one place that pink was going to go - towards the corner pocket. A very strange shot. "The Ronnie O'Sullivan match may have taken it out of him." Shaun Murphy is edging closer to the Masters trophy here. Ten frames will win it, Neil Robertson to break. He needs this one. "It all went wrong for Neil Robertson in that frame. Early on, he was in prime position but played a poor shot to hamper himself." Neil Robertson pots the yellow but a double on the green misses middle left. Shaun Murphy then gets lucky with the green which leaves nothing on for Robertson. This frame is 30 minutes old already as a tactical battles ensues before a mistake by Robertson gifts Murphy the pink and allows him to clean up. Dan: Amazing tactical exchange by Murphy and Robertson! Neil Robertson doesn't take up the chance, sinking a solitary red before Shaun Murphy is back in. He plays it safe and Robertson sinks the final red middle left, but can't follow that up. 53-32. Michael: If Robertson doesn't clear up, he's not winning this match tonight. Nick Cox: It might be a long night if @nr147 gets the first couple! Shaun Murphy tucks the cue ball up behind a red near the baulk cushion. Neil Robertson kisses it and sends the cue ball down the other end. Murphy's safety is poor and presents Robertson with the chance to take this frame. Big frame this one and don't both players know it? It is all very tactical with no clear opportunities on the two reds remaining on the table. Shaun Murphy misses a red to put Neil Robertson back in but a double kiss means another visit for Murphy. The cue ball is up against the cushion but Murphy pulls out a beautiful long pot straight down the throat of the green pocket. 51-32. This is good stuff so far from Neil Robertson, he has a 51-8 advantage but there are some difficult reds on the table to come, but he misses a long blue before them. First blood to Shaun Murphy with a lovely long pot to the bottom right. Black is on and Murphy has the chance to build a healthy score here, but he only manages eight when another long red hits the jaw of the green pocket. Neil Robertson steps up to the table. It is a typical, tentative safety battle in the opening minutes of this frame, no-one wants to give an inch. "The atmosphere is making the hairs on the back of my neck stand-up, I don't know what it feels like for the players. "We know how crowds love a comeback, they will certainly want to see one tonight. It is imperative for Neil Robertson to get the first frame on the board." Who will have their hands on this in a few hours' time? Out trot the two players to the sound of their respective walk-on music. Shaun Murphy is all smiles, Neil Robertson looks focused as he gives a little wave to the crowd. Murphy to break. Here we go. GM: Come on Murphy finish the job! And win your first Masters! Kenny Kong: If Robertson comes back from 2-6 down against Murphy (yet to win this title), this will become another classic of The Masters. Dramatic shots of our two finalists in the opening montage on BBC Two. "This is my time" declares a straight-faced Shaun Murphy. The cameras are rolling and television coverage is LIVE. Forget about work tomorrow, it is all about the green baize right now. which you can watch again online. More to come? BBC Sport's Frank Keogh: "Murphy was rated a 7-4 outsider by bookmakers to win the final but is clear favourite at 1-4 after opening up a big lead, while Robertson (odds-on at 1-2 beforehand) is now out to about 3-1. "The Magician, whose world title win came 10 years ago, began the tournament at Alexandra Palace as a relatively unconsidered 16-1 shot, while the Thunder from Down Under was 7-1 third favourite, behind Ronnie O'Sullivan and Judd Trump." Q: Harry Bowler. Why did you waste your life playing snooker, it is not even a sport so why? SH: I think with what I have achieved, it's not been wasted. Q: Oyewole Felix Bosco. Apart from snooker what other sport did you like playing and which team did u support? SH: I love playing golf and I support Chelsea. BBC Radio 5 live snooker reporter Jamie Broughton: "Great excitement here for the final, it's not as close as many expected. But, by winning two out of the last three frames, Neil Robertson isn't out of this at 6-2 down. He can quickly win back-to-back frames, and how nervous will Shaun Murphy be if he gets close to victory? He needs the Masters title to complete the triple crown of big snooker events. 10 needed to be champion." Aodhan: Neil Robertson 2-6 Shaun Murphy. Didn't see this one coming. Still got plenty to happen this evening. Ian Robbins: At 2-6 there's still a chance for Robbo but he needs the first frame tonight and 3 of the first 4 you'd think. BBC Two coverage begins at 19:00 GMT and you an access that video at the same time at the top of this page. For now, you are stuck with my words. Sorry about that. Welcome back to our coverage of the 2015 Masters final. Shaun Murphy looks to be on the verge of joining only nine other players - including Robertson - who have won all three majors of World, UK and Masters crowns. Neil Robertson, though, may take heart from a little rally towards the end of the first session this afternoon, winning two of the final three frames. Too little too late, though? Call me crazy, but I can't help but feel we are in for something epic. Neil Robertson may be trailing 6-2 and have been as much off his game in the first session as Shaun Murphy was on fire, but he is the world number one, and with good reason. Surely there is twist in this tale? Right then, time for me to resupply on some snacks and what not because you never know, we could be in for quite the battle tonight. We'll be back at 18:30 GMT before the second session begins at 19:00. Have a read of the full report from the first session and see you in a couple of hours. where Stephen Hendry is waiting to answer your questions. "It is really good news and we love the uniqueness of Sheffield. We have always said that while we have the support of Sheffield and the BBC, nothing changes. We have reached an agreement with the council to stay there until 2017." remain at the Crucible Theatre in Sheffield until at least 2017. "Neil Robertson has had a slightly below par session and needs to put a line through it and go into the final session all guns blazing. He needs to come back refreshed and give it everything." Lee Housley: Just a matter of time until the Masters is won by @Magician147. Too good for Neil Robertson today. "From Shaun Murphy's perspective, nothing you can complain about. He has a big lead going into the final session. Neil Robertson goes into it with nothing to lose." Fantastic stuff from Neil Robertson as he nails a long red and goes on to clinch the frame. It keeps him in this ahead of the evening session, just. "Not about hitting it, but can you get it safe?" A tricky red ends Shaun Murphy's break at 49. He plays a solid safety behind the black but Neil Robertson gets out of it, successfully ensuring the red is not on for Murphy in the process. Safety battle at the moment. At the end of this session you can ask Stephen Hendry anything and everything you like about snooker. BBC Sport Facebook. so get your questions too him. Neil Robertson needs this frame. He gets himself out of a sticky situation by seeing off a difficult blue to keep him at the table and goes on to build up a 43 lead. A cracking safety shot towards the baulk cushion leaves a tough red for Shaun Murphy, but he nails it. Murphy's chance now. Mark: Murphy's in beast mode! Best form of his life! Raj: Always been a fan of Shaun Murphy. On form, very very good. Lacks consistency though. Steamrolling today. The Thunder from Down Under has a face like thunder at the moment. That glimmer of hope Neil Robertson had from the sixth frame has been snatched away by a methodical display from Shaun Murphy in the seventh. Into the eighth and final frame of this session. Can Neil Robertson come back from this? The stats don't make clever reading for him so far. "It was a wake up call for Shaun losing the sixth frame. He is back focussed and that is what has impressed me about Murphy, being able to win frames in one visit." No return visit for Neil Robertson as Shaun Murphy takes the frame with one left in this session. 6-2 is the best Robertson can hope for now. BBC Sport's Shamoon Hafez: "Having lost the sixth frame in this final, it brought to an end Shaun Murphy's 11-frame winning streak in the competition. The Magician won six-in-a-row against Mark Allen last night, and the first five today." Shaun Murphy sees off a superb long red into the bottom left pocket and sets himself up nicely for a colour. He sets about building up his break and Murphy looks on course to claim this frame. Shaun Murphy drops a red into the bottom right, he was hoping to get the cannon to put him on for the black but instead he is left with nothing. He plays a safety up to baulk. "A brilliant break from Neil Robertson. We can all play when the sun is shining, but what can you produce when the black cloud is hanging over you? Everyone wants to see a close match being played and that is that start of it." Neil Robertson gets himself on the scoreboard and saves himself the ignominy of a whitewash. Shaun Murphy nods the concession after a break of 80 from Robertson. That will do the Australian the world of good. BBC Sport's Shamoon Hafez: "The only whitewash there has ever been at the Masters was in 1988, when BBC Sport pundit Steve Davis trounced a sorry Mike Hallett 9-0 at the Wembley Conference Centre." A sign of just how below par Neil Robertson has been - he's on 35 at the moment, his highest break in six frames. He looks on course to go well beyond that though. Mary O'Connell: Can't believe Neil Robertson is so far behind. Wonder if he felt all he had to do was beat Ronnie. "I think Neil Robertson has run his race. World number one against Ronnie O'Sullivan was a massive game, and he put everything into that." Three more frames to play this afternoon. Can Neil Robertson claw himself back into this? Sixth frame is under way. "Neil Robertson looks like he is in his shell. He had a chance early on in the frame to go into the pack of reds but played a conservative shot. He came unstuck. Shaun Murphy had a chance to do the same and careered into the pack." Steve: Robertson was 5-1 down to Selby in the 2013 UK and won 10-7. Not a foregone conclusion yet. And he does so to make it five out of five after his toughest battle yet. Superb stuff from Shaun Murphy as he screws the cue ball off the right-hand cushion after potting a red and it loosens up two reds. Good chance now to take this frame. Neil Robertson squeezes a red into the yellow pocket, a bit of luck about that but he will take what he can get in this frame. The black follows in the next shot but he misses a tough red and it is over to Shaun Murphy. Shaun Murphy holds a 37-24 advantage and it has been like that for a while in this frame. No-one wants to take a risk. Murphy has a long, hard look at the table as he weighs up his options, one minute 55 seconds it takes him before he attempts a long red to the green pocket, misses. Thirteen minutes since a ball was potted. "Arguably this frame could win Shaun the Masters. Big moments perhaps." Shaun Murphy is getting no dice with that left middle pocket as he watches a red strike the jaw. After some pretty faultless snooker, he has made a couple of errors in this frame. A few safety exchanges follow with both Murphy and Neil Robertson looking very tentative. They know this is a big frame. "It is imperative for Neil to win this session 3-1. Until you get that fifth frame for a lead at the interval, you always have it at the back of your mind that you might end up being 4-4." Error-strewn frame at the moment as Shaun Murphy misses a long red to the bottom right pocket before Neil Robertson does likewise on the opposite side. Cagey. Four frames down and Neil Robertson's highest break stands at just 30. A big improvement is needed when he visits the table, and he is back up when Shaun Murphy misses left middle. What can he do now? Neil Robertson needs an early opportunity to get back into this and he gets it, but he can only manage a break of 15 as he tries to power the black into the bottom right, too much on it and Shaun Murphy has his chance to stamp his authority on frame five. The players are back out and Shaun Murphy to break. Four frames to come before the end of the first session. "It is a bit of self preservation for Neil Robertson in this mini session. If he can get 5-3 behind that will be a big result for him." 1-0, 1-1, 1-2, 2-2. That's how things stood after four frames of the 2012 Masters final between these two. Close, but Neil Robertson flew out of the blocks in the second session on that occasion and dominated Shaun Murphy to take victory. Surely plenty more twists and turns to come in this one? It is shaping up to be an absolute classic. Shaun Murphy says he almost quit snooker 12 months ago. A sit down, a serious think about his career and he chose to instead focus on getting himself where he wants to be. The 'triple crown' has been his target for a while now, and he is looking good at the moment to finally achieve it. He'll be itching to get back out there. "Shaun Murphy is is playing better than he has ever played. The last time he played with so much enjoyment is when he won the world title in 2005. If he plays like this in April/May, there is no-one who can touch him for his second world title. "Murphy is taking on shots with so much danger, he does not care. That is the best way to go for pots." DQM: Shaun Murphy putting the World Number One to the sword here!!!! Golden Cue Snooker: Can't believe what's happening to Robertson, credit to @Magician147 playing unbelievably well ! "Neil Robertson's safety play hasn't been the best but he is also playing against someone who is supremely confident. If I was Robertson, I would take 6-2 because he is being comprehensively outplayed." So Sean Murphy leads 4-0 at the mid-session interval. Where is the Neil Robertson who so confidently despatched of Ronnie O'Sullivan in the semi-final? He needs to make an appearance soon. A missed red means Shaun Murphy's visit ends with a break of 76. The crowd expects Neil Robertson concedes but he returns to the table. He needs five snookers. It is too big an ask and he concedes. Shaun Murphy pots the black into the bottom left and the reds are well placed for some heavy scoring now. The stats don't make good reading for Neil Robertson - 96% pot success rate for Murphy, 76% for Robertson. Not good enough. "Neil Robertson is under real pressure at the moment and that is down to Shaun Murphy's play. A little shake of the head from the Aussie, you don't see that too often." Better from Neil Robertson as he clips a red into the right middle. He then misses a long brown into the bottom right, however, and it's Robertson 8-5 Shaun Murphy in this frame. Shaun Murphy styles it with a humdinger of a pot - a long red drilled into the right corner to get up and running in this frame. Nothing on after the cue ball rebounds into the reds and up steps Neil Robertson. BBC cameras zoom in on a couple of spectators showing their love for Steve Davis with t-shirts sporting the words "We love the Nugget". "At least somebody does" quips Dennis Taylor, prompting chuckles from the crowd listening in on their earpieces. Shaun Murphy fails to sink a long red into the corner pocket, much to the relief of Neil Robertson. This frame is five minutes old and nothing down yet. "Shaun Murphy looks very, very confident. The fourth frame is a big one for Neil Robertson." Neil Robertson steps up to break in frame four. He needs to get off the mark here, otherwise Shaun Murphy is going to be difficult to catch. There it is, Shaun Murphy clears up and its a break of 127. Stunning stuff. I thought this was going to be tight, maybe not? "Shaun Murphy looks like a man on a mission here. What a start!" This is brilliant snooker from Shaun Murphy. The confidence is absolutely flowing as he cuts a red into the middle right pocket. Could be some heavy scoring now as he sets about surpassing the century mark and taking frame three. "Everything going into the centre of the pocket for Shaun Murphy. The crisp sound as the ball hits the leather." A red into the middle pocket sends the white up to baulk. Shaun Murphy does not like this, but recovers well by drilling the green into the left middle, 51 so far in this break and he shows no sign of stopping. Shaun Murphy gets the first red down and he is on the pink, drains it in the far corner. Red, pink, red, pink at the moment as Murphy builds this break. Jurgen Gruson: What happens when an unstoppable force meets an immovable object? Great stuff this! Paul Barker: The Magician is weaving his magic. Come on Shaun. "Shaun Murphy has worked on a lot of things but he changed his technique and he has been given some different routines to improve on his concentration." Shaun Murphy's mum picked this tournament to be the first one she saw her son play live. So far, it is looking a good choice. Perfect start for Murphy as we enter the third frame. "Both these players have looked untouchable this week, that can't continue. Every day is different and Shaun Murphy has made a good start." An attempted snooker does not quite come off for Neil Robertson and Shaun Murphy is 19 ahead with 13 points remaining. Pie PAFC Face: Do you think that Neil Robertson is looking very shaky in these early frames? Hang on, Neil Robertson is not giving this one up without a fight. He gets the white behind the black again for a snooker, from which Shaun Murphy can't escape. Two more snookers and Robertson will be back in this. Neil Robertson is incredibly unlucky after returning to the table as he places the white right behind the black for a great snooker, but also pots the green in the middle pocket by mistake. Not what he wanted. Shaun Murphy is on the verge of moving two frames ahead. Recently married Stephen Fry on Twitter: When your better half lets you watch the @bbcsnooker you know that marriage is a fine thing. Shaun Murphy makes a break of 45 when the black rattles the jaws of the bottom left corner pocket and fails to go down. Neil Robertson steps back up, but it is a short stay, seeing away a red but missing the blue. A great view of what Neil Robertson and Shaun Murphy will be seeing in today's final. There was an opportunity for some heavy scoring there but Neil Robertson fails to capitalise, its a break of 30 and Shaun Murphy returns to the baize. A poor safety from Shaun Murphy leaves Neil Robertson with enough sight of a red. It's a long pot but Robertson nails it. Murphy leans back in his seat. This could be a long wait. Shaun Murphy exuberates confidence as he strides around the table, sizing up his options. Neil Robertson had the measure of Murphy tactically in the 2012 final, but the latter has worked on that side of his game considerably since then and it shows. Great battle between the pair in this second frame, with neither leaving the other a pot on. "Is it essential you get a good start in a final, especially against the world number one Neil Robertson. Shaun Murphy will be over the moon with that frame." "A cagey start but when Neil Robertson did get in, he missed a pink. That is one frame where an unforced error has been a catalyst, as opposed to someone getting one because of a good safety shot." An error from Neil Robertson and Shaun Murphy gobbled it up. A break of 63 and Robertson concedes. First blood to Murphy. Key to this final might be taking frames in one chance, which Murphy does. Game on. Shaun Murphy is finding a bit of rhythm now, 49 ahead with 67 remaining and two reds in the open. Is he going to finish this one off? The 1984 and people's champion Jimmy White is in the crowd once again. The Whirlwind has been an interested spectator throughout the week at Alexandra Palace. Neil Robertson misses a pink after mustering six points. He screws up his face in frustration, he knows he should have seen that away. The 2012 final between these two was initially a very cagey affair, with the score 4-3 after seven frames but eventually Neil Robertson took control. Are we in for something similar today? Dan: In for a great day of snooker..two of the great talents in the game! Gregg Howe: Come on then @nr147. Smash it like the boss you are. "The Masters will complete the triumvirate for Shaun Murphy. He will be full of confidence and attack from the front. He just needs to play the way he has and win frames on one visit." Shaun Murphy sees away the first pot of the final, a red into the bottom left corner pocket. He leaves himself with very little on though and he can only manage six before Neil Robertson returns to the table. "I am not going to predict who is going to win but both these players are form players. Murphy played faultless snooker against Allen and it will be a cracking final." One word for the opening few minutes of the first frame - cagey. Safety exchanges are the order of the day, while Neil Robertson displays some early jitters as he fails to sink a long red. Nothing down yet. A few shouts of encouragement from the crowd before quietness descends in the Alexandra Palace. A shake of the hands, a smile for the cameras and the two players take their positions. Best of 19 frames - Shaun Murphy to break. The 2015 Masters final is under way. That's the walk on music of choice for Shaun Murphy at this year's Masters. Good choice? Got to admit, can never help but tap my toes whenever I hear it, it is definitely the sort of tune that settles nerves. MC Rob Walker, drama etched all over his face, is speaking now. The crowd is ready, the players are ready. Are you? BBC Sport's Frank Keogh: "Masters finalist Shaun Murphy tells me he still listens to 'Shoot To Thrill' by AC/DC before matches, but he enjoys an old favourite for his walk-on music. "'It's all about Disco Inferno. I love it,' he says. Last year, Murphy arrived in the Alexandra Palace arena to Stevie Wonder's Superstition. "His opponent Neil Robertson prefers Heart Of Courage by Two Steps from Hell, which is used in the video game Mass Effect 2." BBC Sport's Shamoon Hafez: "Destiny awaits Shaun Murphy as he looks to become only the 10th player in snooker history to complete the 'triple crown' of World, UK and Masters titles. "I spoke to Murphy ahead of the tournament and it seemed as though he wasn't expecting too much from this tournament. "A chest infection over Christmas put his preparations back by a week and it certainly felt he was looking to future Masters tournaments when he mentioned wanting to win the crown within the next 10 years. "But three superb performances this week leaves him on the verge of a memorable triumph." "John Virgo said he thought Shaun Murphy was in a very good place in his head and he played in the semi-final like he has a force field around him, but he is coming up against another player who seems to have a force field around them, whose is going to weaken?" Allen led after breaks of 83 and 62, before Murphy won six straight frames to win the match and give himself the chance of claiming a first Masters title as well as career 'triple crown'. 'The Magician' can join an elite group of nine players who have won all three of snooker's majors, having won the 2005 World title and 2008 UK crown. Ronnie O'Sullivan, who was the defending champion, saw his 15-match winning streak ended in emphatic fashion by Neil Robertson on Saturday. Robertson won 6-1 to reach his third final in four years and leave O'Sullivan to reflect on his own game. "I am not the player I was 18 months ago," said O'Sullivan. "If I can get it back by playing more, I think I can." These two last met at the 2014 Wuxi Classic quarter-final with Neil Robertson triumphing 5-4, improving his head-to-head record to 11-7. The stats are very much in Neil Robertson's favour but right now they don't count for much, it is all about who handles this final better. We've got live coverage on BBC Two and online at the top of this page now, direct from the Alexandra Palace. First up, some emotive VT to get us all in the mood. Get on it. "Neil Robertson was tactically very adept in the 2012 final but Shaun Murphy was absolutely outstanding yesterday and produced some heavy duty scoring and I think he is a better player." This final is of course a repeat of the 2012 Masters final - the first to be held at the Alexandra Palace. After a tense first session, Neil Robertson triumphed 10-6 on the back of a dominant display in the second session. Robertson brought his son Alexander out to enjoy the celebrations on that occasion, but the youngster was more interested in playing on the snooker table than his dad's victory. Three years on, he'll probably understand more about what it all means, if Robertson wins. As has been the case throughout the tournament, the Masters final is live on the BBC on television and online. BBC Two coverage begins at 12:50 GMT and runs until 17:15 before resuming against at 19:00. You can also have a look back through the highlights of the tournament by clicking the highlights tab at the top of this page. Mike Pegler: The way Robertson dismantled Ronnie yesterday he will take some stopping me thinks. Matt Andrews: Actually going to go for Murphy many people opting for Neil but perhaps Murphy will make it more of a thinking game. The Alexandra Palace doors have been open for just over one hour and the seats are filling up nicely as MC Rob Walker warms up the crowd. An extra 200 seats were brought in this year, taking the total capacity to 1700. In demand, this. Shaun Murphy on Twitter last night: I'm so rock and roll. Back to the apartment after a mammoth game tonight and it's pyjamas and a coffee in bed. Thanks for the support guys. Nothing wrong with that Shaun, consummate professional. Neil Robertson on Twitter: Morning guys! Final of The Masters today 1pm start. Hello! Welcome to live coverage of the 2015 Masters final. The defending champion has been dumped out meaning we've got ourselves a repeat of the 2012 final - Neil Robertson versus Shaun Murphy. Robertson has been sizzling throughout the tournament so far, with the highlight undoubtedly being his dominant dismantling of Ronnie O'Sullivan in the semi-final. ...but none of it was good enough to stop the might of world number one Neil Robertson powering into the Masters final. Can Shaun Murphy succeed where Ronnie O'Sullivan failed?